A second away game in 5 days saw Ha Noi T&T travel to Ho Chi Minh City to face last season’s runners-up Xuan Thanh Sai Gon, a fixture cancelled earlier in the season due to Sai Gon’s participation in the AFC Cup. This time it was pre-planned that I’d be attending the game alone. As I settled down for a late breakfast, Ho Chi Minh City was bathed in sunlight, and I had a good feeling about the day ahead and the evening kick off. Not half an hour passed before the rain lashed down again, with the streets turning in to mini streams. Reminder to one’s self: RAIN GEAR! Being alone it’s easy to save some money by opting for a xe-om over taxis, and they’re also a great way to experience the roads of Vietnam without having to drive. I carefully picked out a driver; the one I figured was sober, or at least not that drunk. He was perched precariously on his bike reading the daily sports newspaper; he’s reading, therefore sober. For the most part he seemed fine until he realized his bike, even with me on the back, would in fact go much faster through the crazy traffic between us and the stadium. After an exhilarant 15 minute ride (not bad as I was informed a taxi may take an hour!) I was dropped off at the Thong Nhat Stadium. Not the prettiest of places, but a lively area with numerous cafes and street side beer vendors. Wondering around I passed most of the Ha Noi squad, also aimlessly wondering as they too had arrived two hours prior to kick off with nothing to do. They opted for a café, I chose a beer vendor; in the hope that numerous fans would flock to the ground early, grab a cold beer with me and generally enjoy some good old football banter. The vendor I chose had 16 tables running down the side of the stadium, two were occupied with an old rather drunk man at each, I joined. I waited. Waited some more. Still no flock of fans. Eventually one guy sat, ordered a beer and asked if I were here for the Bong Da (football), “Yes, yes I am!” Dao introduced himself, a student in HCMC originally from Dalat. He liked football, but Sai Gon weren’t his team, admitting he didn’t know their current league position; he just enjoyed watching live football. We chatted for a while, Dao taking the opportunity to practice for his upcoming English exam, before setting off for the game. Wisely I’d bought tickets in the covered main stand (slowly but surely learning that monsoon season means rain).I left Dao rather confused that my only purpose for travelling to Sai Gon was to support Ha Noi T&T. Thong Nhat stadium is of similar design to many in Vietnam; large covered main stand, running track and stepped concrete terracing completing the remaining three sides. Unfortunately with Sai Gon in mid table boredom, there wouldn’t be too many fans to fill the stadium, with only 4000 in attendance. But the small number did get to witness a rather bizarre tactical move from the T&T coach, Thanh Hung, who opted to switch the league’s second leading scorer, Gonzalo, to central defence in the absence of suspended right back, Quoc Long. With Ha Noi comfortable victors over Sai Goin in the reverse fixture I’d have preferred to see the coach take the game to them, with Samson just behind Gonzalo in attack, and young full back Ngoc Duc being giving a chance, allowing Cristiano and Van Bien to continue their strong central partnership. But this wasn’t to be, Hanoi invited Sai Gon to attack and within 13 minutes were 2-0 down, thanks to Tai Em (5’) and a Rogerio (13’) penalty. The defence was in slight disarray and the home side seized the opportunity. 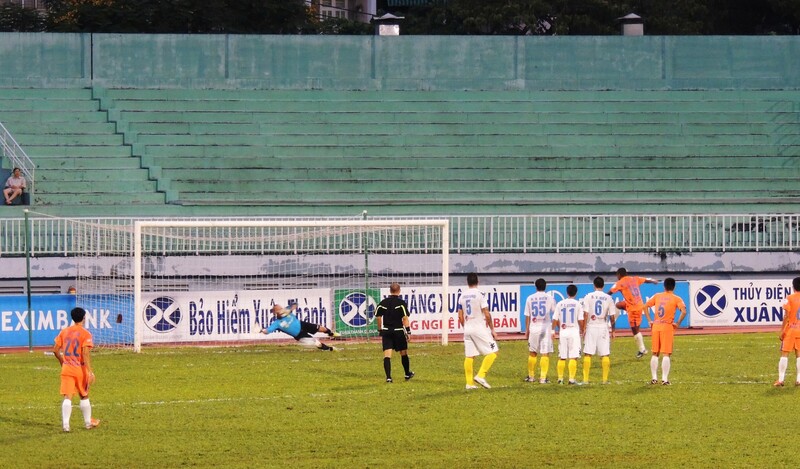 Hanoi rallied though, and Van Quyet (22’) flicked a cross beyond Tan Truong before Samson (30’) scored a great solo effort from just outside the box, 2-2. There was still time for a 5th goal of the half, as Cristiano committed the foul that ultimately resulted in the second penalty of the game, Rogerio (42’) had no problems converting again. Half time 3-2. I was slightly annoyed and decided a Banh Mi (pate sandwich mix, I’ve never been too sure of the exact ingredients) was a sure cure. Within minutes I was crying at a football stadium for the first time in my life as I seemed to have chosen the baguette with extra chili’s, I battled on though, and within minutes had consumed the whole thing. I ran back up the main stand, tears running down my face desperately in need of water. Within 5 minutes of the restart Van Hieu (50’) placed the ball in to the top corner from just inside the area, 3-3. The game would stay this way, but the remainder was tense as both sides had great opportunities, with Samson always a threat as T&T’s lone striker and Hong Son in the Hanoi goal in fine form once again. 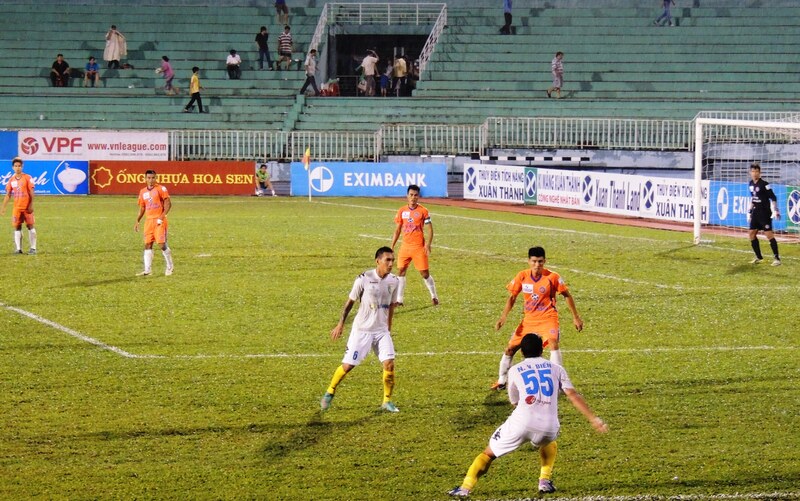 The players left the field dejected; Hanoi had dropped 4 points in the last two games. I too was down as I left the Thong Nhat; wandering how this would affect the title race and why on earth would you play your striker at centre back?